A new paper by Jörg Stoye and Yuichi Kitamura (Yale), “Nonparametric Analysis of Random Utility Models,” was published as the lead article in the November 2018 issue of Econometrica. This paper serves as the capstone of Stoye’s NSF Grant (SES-1260980 ), generously awarded by the National Science Foundation from 2013-2016. Econometrica is one of the most prestigious journals in the field of economics. Published by the Econometric Society, Econometrica began in 1933 with the goal of advancing economic theory in its relation to statistics and mathematics. 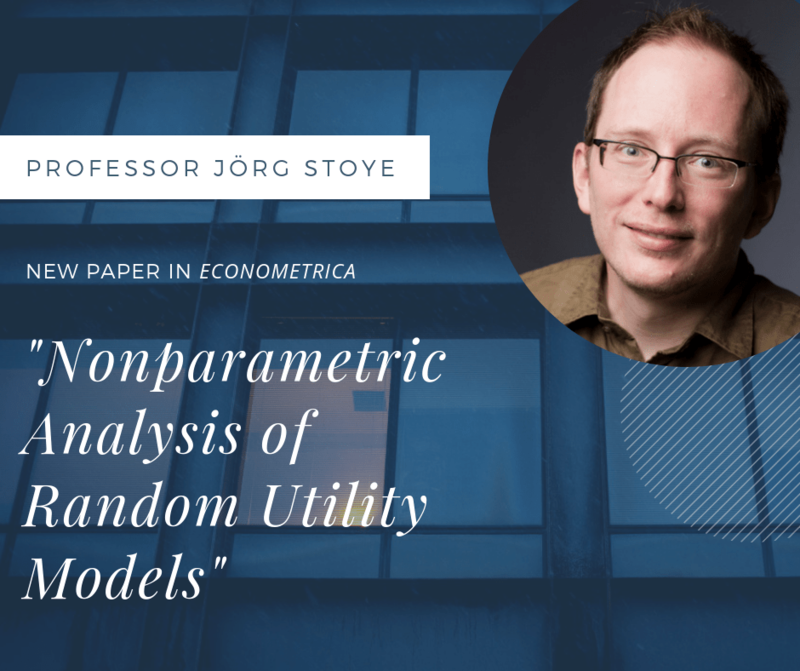 Read "Nonparametric Analysis of Random Utility Models" and its supplemental materials on the Econometrica website. "This paper develops and implements a nonparametric test of random utility models. The motivating application is to test the null hypothesis that a sample of cross‐sectional demand distributions was generated by a population of rational consumers. We test a necessary and sufficient condition for this that does not restrict unobserved heterogeneity or the number of goods. We also propose and implement a control function approach to account for endogenous expenditure. An econometric result of independent interest is a test for linear inequality constraints when these are represented as the vertices of a polyhedral cone rather than its faces. An empirical application to the U.K. Household Expenditure Survey illustrates computational feasibility of the method in demand problems with five goods." Jörg Stoye is a Professor in the Department of Economics. His research focuses on microeconometric methods, especially as they interact with microeconomic theory. Currently, he is studying inference under partial identification and on the statistical testing of Revealed Preference conditions. Other recent work includes research in statistical decision theory (e.g., on treatment choice as a decision problem) and on related questions in pure theory (e.g., axiomatic foundations for the Minimax Regret decision criterion). Among other outlets, Professor Stoye's research has been published in Econometrica, the Review of Economics and Statistics, the Journal of Econometrics, the Journal of Economic Theory, and Quantitative Economics. Professor Stoye currently serves as Associate Editor for the Review of Economics and Statistics and as moderator of the econometrics domain at arXiv. He holds a Ph.D. from Northwestern University, an M.Sc. (Distinction) from the London School of Economics, and a Diploma from the University of Cologne. To learn more about Stoye’s research, visit his faculty page here. Yuichi Kitamura serves as Professor of Economics in the Department of Economics at Yale University. Visit Kitamura’s faculty profile here.